We’ve previously explored the history, function, and design elements of the cupola, but more than anything, we just love the way they look. It’s the cherry on top of a beautiful home. 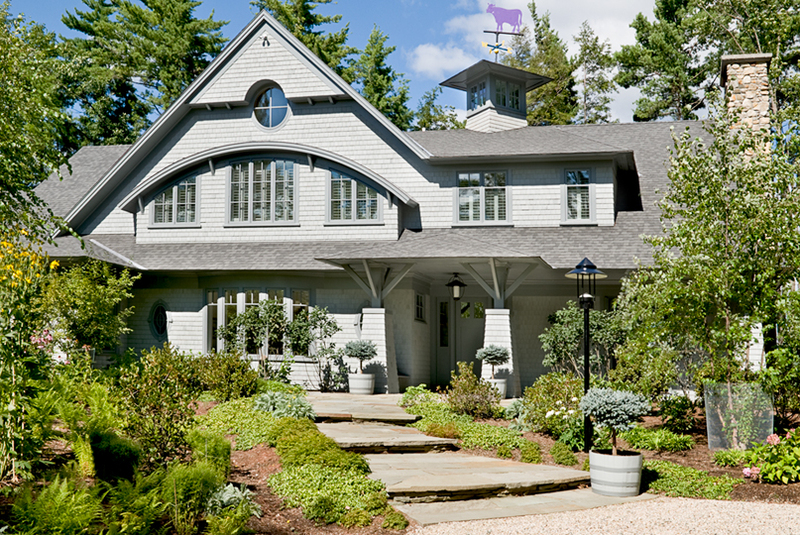 A dose of classic New England niftiness, often paired with a weathervane that offers a glimpse into the personality of the homeowner. 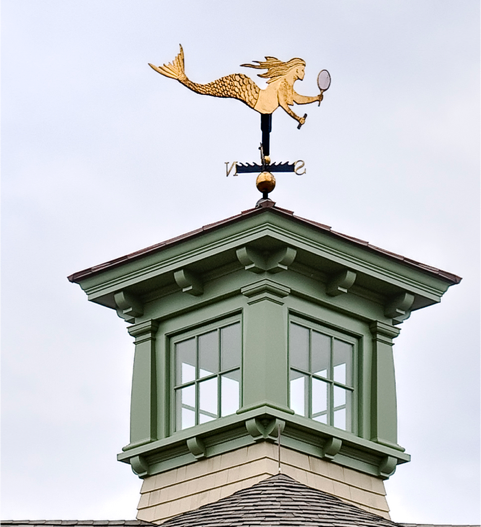 Today, we’ll take you through some of our favorite cupola and weathervane pairings of all time. The finishing touch on this Seaside Renovation was a natural stone tower topped with a large weathervane shaped like a ship. 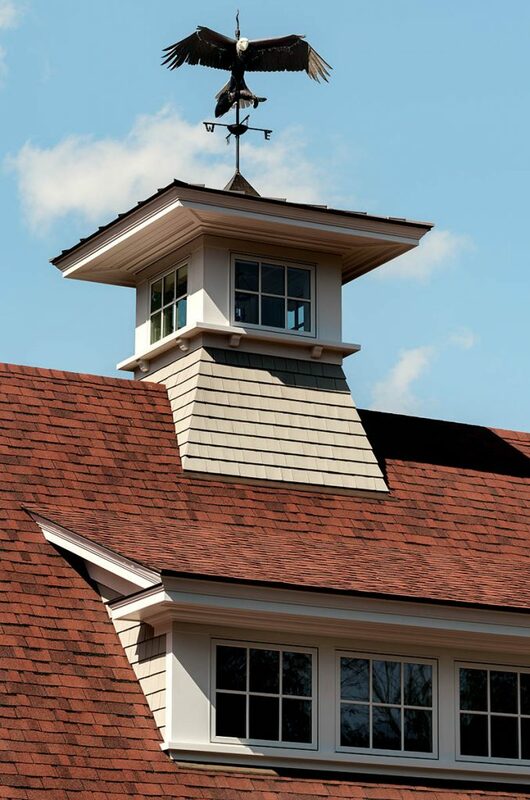 Selecting the right size weathervane is key, as what looks good in hand is often too small on top of a home. 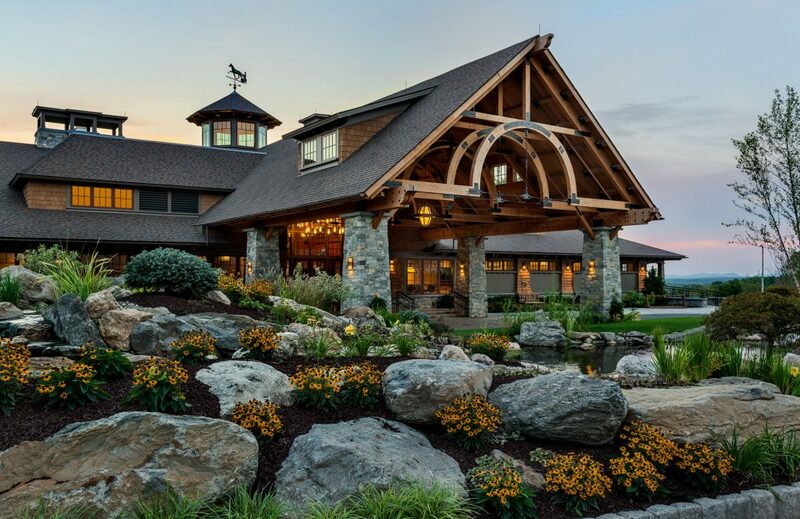 We often work with local artisans like Steeling Nature in New Castle, NH to create a custom design that’s a perfect fit for each home… and each homeowner’s personal taste. 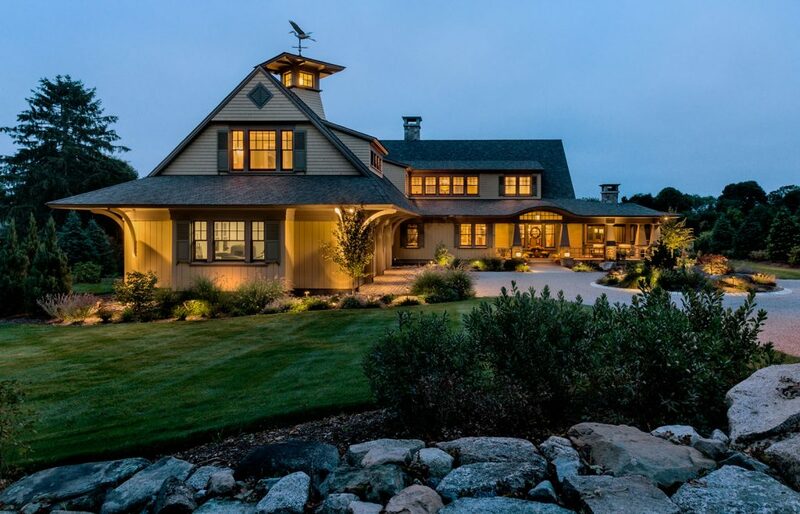 A cupola with a large overhang or a 45 degree rotation from the roof’s ridge makes a dramatic statement, as seen in this Hampton Seacoast home. Taking a closer look, you’ll notice the crown jewel topping this cupola: a custom gold leaf mermaid! Our client’s wife had always wanted a beach house with a mermaid weathervane, and we were happy to fulfill her dream with this small but meaningful design detail. The homeowners of this cozy New Hampshire hideaway love birds, so it became a recurring theme throughout the home. Naturally, we topped this classic cupola with a detailed bald eagle weathervane! These clients found their dream property right in the middle of a rolling New England meadow. 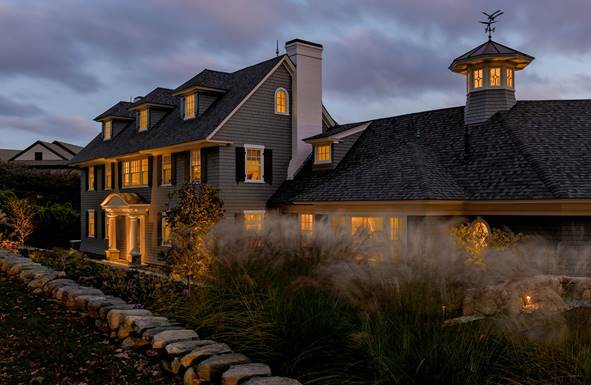 Large overhangs are present throughout the exterior design, connecting the home to its surroundings and adding detail and drama to its cupola. The homeowners chose a great blue heron for their weathervane, as they often see them on the river behind the house year round. The owners of this coastal, Victorian home also chose a classic bird motif to top their octagonal cupola. This design by East Coast Weathervane depicts three geese flying through the air. This lakeside family playhouse is full of fun details, and its cupola and weathervane are no exception! This weathervane is a custom copper creation featuring loons on a lake. Breaking away from the classic bird designs, this weathervane really captures the homeowner’s personality. This Williams College alum selected a purple cow, the beloved mascot of his alma mater. 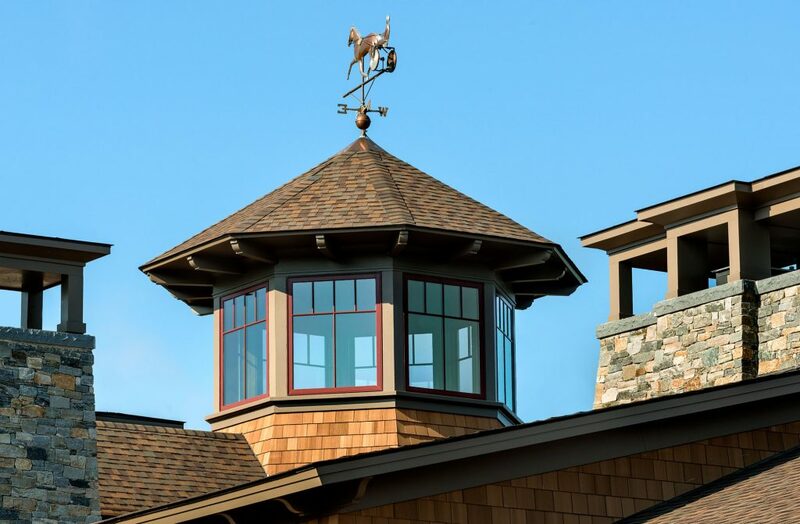 Finally, a weathervane designed by Weathervane Sculpture rounds out the equestrian-inspired GreatHorse Country Club. It features a horse (Moni Maker) and sulky (two wheeled cart) — a nod to the owner’s family’s harness and horse racing business. Though the homes we design are often large in scale, we take great care to capture each client’s personality right down to the smallest of details. If you’d like us to help you build the home of your dreams, contact us today.